I just wanted to get that out in the open right now because it’s very, verrrry tempting. 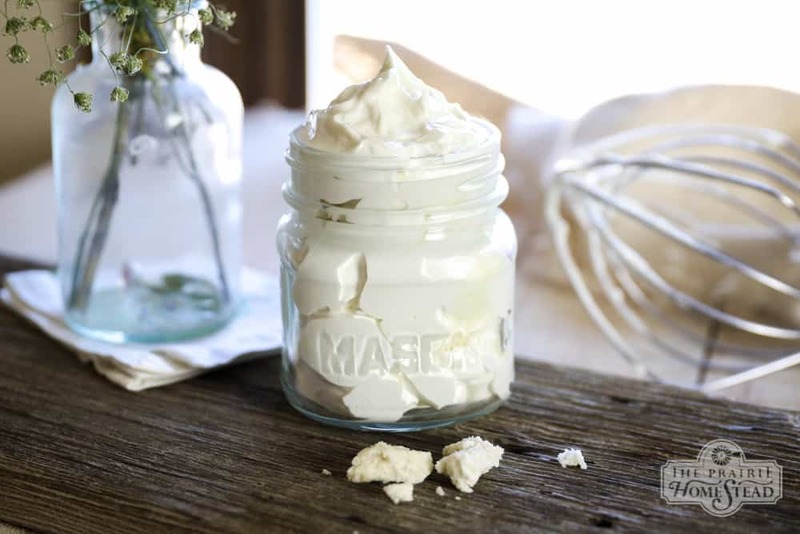 OK, well technically you *could* eat this whipped body butter recipe, because the ingredients are perfectly safe, but it’ll taste kinda gross. That being said, your skin will absolutely adore this simple whipped body butter made with natural, nourishing ingredients. It’s decadently moisturizing (without being greasy) and it smells like chocolate–need I say more?? Combine all ingredients, except the essential oils, in a small pot or double boiler. 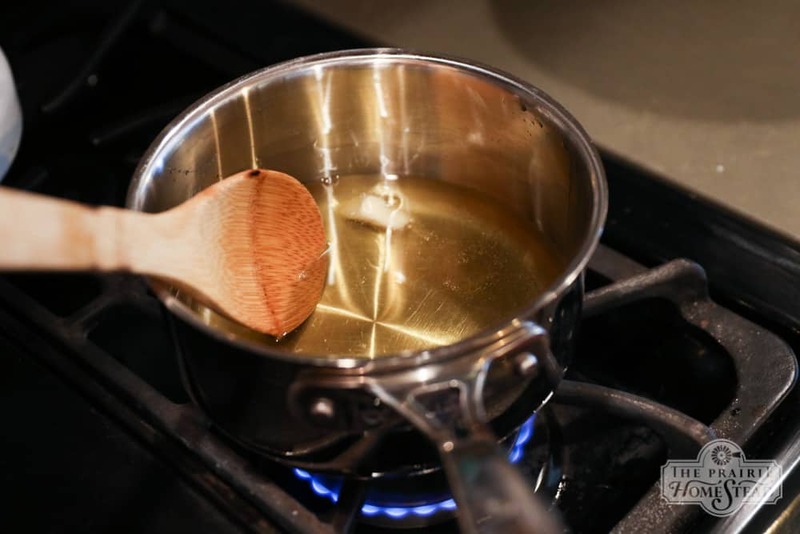 Gently melt and stir over medium-low heat until the mixture is liquid. Remove from the heat and allow the mixture to partially set up. I’m horribly impatient, so I put mine in the freezer to speed the process. (And then promptly forgot and left it in there way to long… *a-hem*). 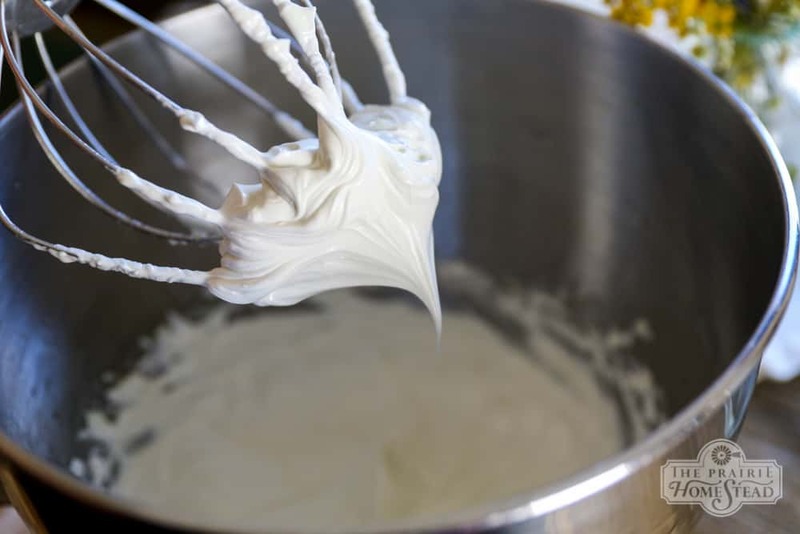 Once the mixture is partially set and opaque, add the essential oils of your choice, and whip with a hand mixer or stand mixer (my favorite stand mixer) until the body butter is fluffy and stiff peaks have formed. If I’ve let it cool long enough, mine usually whips up within one to two minutes. The body butter in the photo is all ready to go– see how it holds its shape? Spoon the finished body butter into a cute little jar. Apply as needed to dry skin anywhere on your body, or give it as a gift! It’s really important to allow the body butter to set up, otherwise it won’t whip. I’ve found it’s ready to whip when I can stick my finger in the middle and it will hold the indentation. However, if you accidentally forget about your body butter in the fridge or freezer and it gets too hard, all is not lost. Simply allow it to thaw at room temperature until it reaches the proper consistency. My favorite essential oil for this recipe is peppermint–especially peppermint combined with the white chocolate body butter recipe… YUM. Other good essential oil options would be lavender, bergamot, frankincense, geranium, or wild orange. But the sky’s the limit! Here’s how I purchase essential oils for wholesale prices. Need other homemade gift ideas? I’ve got ya covered! Any chance there would be a substitution for the almond oil? I can’t wait to try this! Apricot, avocado, or jojoba oil will work too. What’s the difference between coconut oil and butter? Is the butter a raw solid? And is it refined without the smell and raw or unrefined the the smell? butter/oil ar ethey one and the same? I mean the coconut butter or oil? Loved the recipe by the way. So is this a lot more like cream than a bar that you rub on your skin? I have made a version of a body butter bar w/ beeswax and it was more like a bar than a cream. Hey Cathy– I think this link might help you: http://thenakedlabel.com/blog/2013/10/28/its-time-to-invite-coconut-butter-into-your-life/ And yes, it is definitely a cream, not a bar. Kathy, I used recipe 2 (without cocoa butter). I tried this twice with different essential oils. Both batches came out fine as far a consistency goes, but both batches didn’t smell at all of the essential oils I used. In one I used Lemon (30 drops). In the other a blend of Frankinscense, lemon and lavender (total about 30 drops). They have almost no scent a few days later. I checked the dates on oils and all were fairly new. any suggestions? It really had the smell of the shea butter/coconut butter mixture. Is it alright if i use coconut, almond, and jojoba oil in my mix or is that too much? 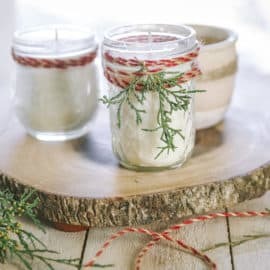 How do I make a big batch of 20-25 body butters in 6 oz jars? My child is allergic to tree nuts. I see that I can substitute sweet almond oil for avocado oil. Would you recommend how I can tweak the measurements in this recipe by using beeswax, mango butter, coconut oil and avocado oil? Having a Hippy moment, making fantastic Body Butter from scratch! What a great gift this would make! We’re in the South and typically don’t need creams or lotions but in the winter, it’s a whole different story! Thank you for sharing this! Oh wow that looks gorgeous, Jill. FYI for those in tick-infested areas, many EOs will absolutely repel ticks in the summer. Lemon, orange, and lavender are the best. I’m excited to try this natural recipe with one of those added. Thank you! 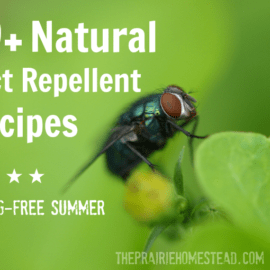 Oh yes– love the idea of turning this into a tick-repellent lotion! Thanks so much for sharing this recipe! I can’t wait to try it out! Curious… what size is the glass container that you have in your picture? And, how much will one recipe make? Thanks again! It’s an odd-sized jar– (old Skippy peanut butter jar) it holds just over 1 cup. Meyenberg had a dried goat milk powder. Would that work? ? This year they will be surprised to get the updated and prettier version — whipped to frothy goodness. Oh, the combination of oils that I used for this quantity of base oils is: 15 drops Geranium, 20 drops Cedarwood, and 15 drops Lavender. Ooooooh, that combo of essential oils sounds awesome! I know this was sooo long ago but the amount of essential oils you use compared the the original post is much higher??? Just want to make sure I have it right. Thanks! In the past I used grapeseed oil to mix salt and sugar scrubs -they were fine at first then became very sticky and probably rancid. Grapeseed oil does not have the shelf life that some of the others do so if you want to use it ,be sure it is used before the year is up or maybe even shorter time.Google shelf life of grape seed oil. Remember to add some Vitamin E to all of your homemade products that include any type of oil in order to help keep a longer shelf life. I buy bottles of liquid Vitamin E, but you can always just pierce a Vitamin E capsule and squirt the liquid into your concoction. Just remember to always add at the very end with your EO. Just made this using the suggested oils, including the peppermint….yum! Was a little worried when I first applied it, seemed really greasy, but it absorbed into my skin beautifully leaving it soft and lightly fragrant. I used a stick blender since the volume wasn’t enough for my Bosch mixer. It worked with some effort, but I’ll definitely pick up a cheap hand mixer for this job next time, or better yet…will make a bulk batch! One recipe fit perfectly into a half-pint jar, although I’d imagine the volume might be a bit more using a proper mixer. Thank you, Jill for such an awesome recipe. Love your blog! My husband and I went to the Salvation Army or good will and picked up a hand mixer we use just for our home mixes. I don’t want to drag out the Kitchen Aid. I have you made many many jars of whipped butter with a hand mixer ,but if you make a double batch and use your Bosch with the wire whisk it goes so much faster. I know cleanup can be a mass, but I think it is one of those things that you just decide to make a larger amount all at one time. The body butter is a wonderful idea for a Christmas gift. Thank you. No I don’t think it’s weird.I think you were trying to show your frugal side. It looks good. Thank you. Help! I had it in fridge and it was partially set up. In the blender it is just creamy liquid! I have been blending for a while. How long should I have to blend for???? I think I blended mine for 5 minutes or so? I used a stand mixer, tho. Mine went a bit liquidy too when I whipped it. But it’s fine! Just put it in the fridge over night. In the morning it’s perfect. I left it in my bathroom and it stayed nice and whipped. This is an awesome gift idea. I know you mentioned that it could melt if left out in a warm house. So, do you keep it in the fridge? How does it last before it spoils? Since it’s winter, I’m not keeping mine in the fridge. But if my house is super hot, I probably would. My body butters have lasted at least 6-8 months, usually longer. Hi! What are your thoughts on infusing aromatic herbs into the oils? Like infusing the jojoba with lavender before making the cream? Do you think the aroma would stay? I ask because my plan is to make a healing body butter for breast massage. I read lavender is great for lymph and breast tissues. Yes, you can do this for sure. 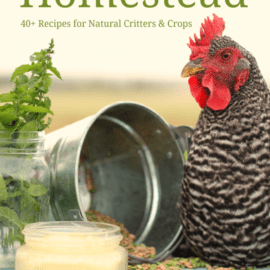 I have made this recipe using olive oil that was infused with Douglas Fir, Calendula and Cottonwood buds. I infuse the olive oil with the herbs for about 6 weeks. Then I strain it and use it in recipes like this. That combination is heavenly smelling and very healing. Can you use refined shea butter instead of unrefined? What is the difference? I want to make this and a scrub for Xmas presents. But I’m worried about how long it lasts. I can have my grandmother using rancid products! Any idea on shelf life?? I am using a hand held mixer and have been mixing for at least 15-20 mins. The mix is still runny 🙁 I let it partially set as directed. What else can I do?? How set was it when you started whipping? You might try putting in the freezer a bit longer. Hi, I’m a late addition I see. Anyhow, I’ve read that you can add 1.5 tsp of arrowroot to the oil before you blend it with the butter to make it less oily. For those who are worried about it melting in higher temperatures, I have had great success with adding a little beeswax to the buyers when I melted them. It still whipped well and the texture stays whipped and creamy in even a warm house. I am not sure exactly how much beeswax to use for this particular recipe but would guess a teaspoonful or two should do the trick. What are the essential oils you used for the chocolate body butter? If you live in a humid area and find a body butter recipe a bit oily try adding a tablespoon or two of arrowroot (tapioca) or corn starch to the mix before whipping. It will make the cream silky and absorb any oily feeling you sometimes get with body butters on your skin. I’ve also had some success with using less coconut oil and more almond oil (split the amount in half). Hope this helps :). Fantastic tip Amanda! Thanks for sharing! How do you measure solid oils like shea or cocoa, melt then measure 1/4 cup or measure in cold water like you would pwant butter for example? I usually just pack them into a measuring cup while they are solid. 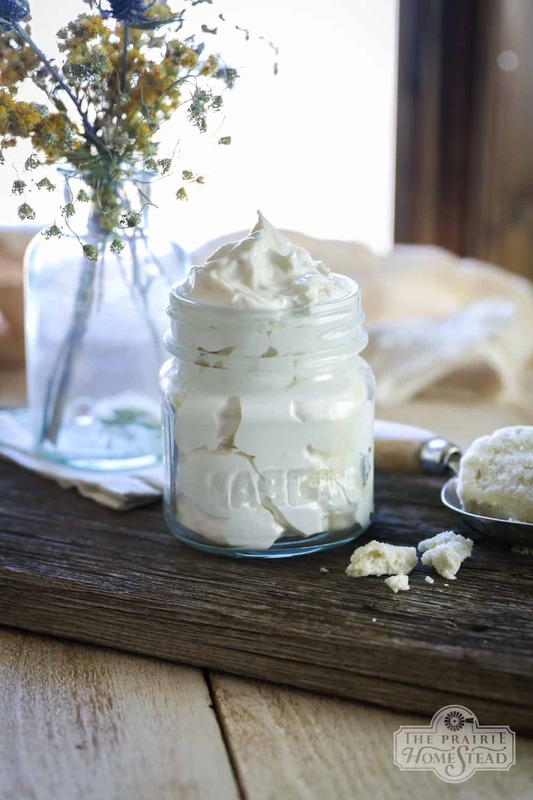 I had decided to try this whipped butter, and oh my gosh, it’s the best recipe I had tried. I had a couple of serious issues with my skin and I used this for two weeks and it completely cure it.. I was given a prescription cream for my issue but after a year of this prescription cream I had no results, so frustrating, so I decided to try making this whipped butter, all natural ingredients, and used it for two weeks and it’s completely gone ? I haven’t been so happy for a year. I’m thrilled. 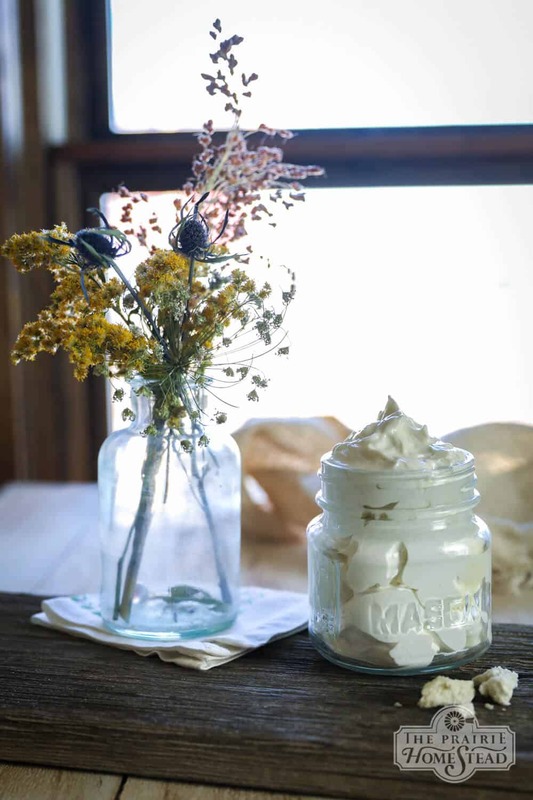 Thank you thank you for this awesome whipped butter recipe. You are a life saver. YAY!! I am so glad to hear of your awesome results with this Jeannette! Thanks for sharing! I loved the recipe! Found it to be a bit greasy though. If I add some arrow root would that stiffen it up and make it less oily? Hmmm… not sure– give it a try and let me know. Yes it will, be careful on the amount though. Yes tapioca starch arrowroot even kaolin clY. 1T and add it as you are whipping, it gives a silk like feel. How long do you put it this freezer for? I followed a similar recipe…twice and it said twenty minutes in the fridge and both batches were runny. At least they were good moisturizers ? Just chill it until it firms up enough to whip– the exact time will vary. The runny ness is due to the ratio of wax (coaoa butter, Shea, Mango) to oils Coconut 96 degree. Solid, sweet almond, Apricot etc. Use 75 percent wax and butter to 25 percent oils.Put in fridge for 20 min and whip add 1T of arrowroot, Tapioca starch(not flour). It will be like silk. 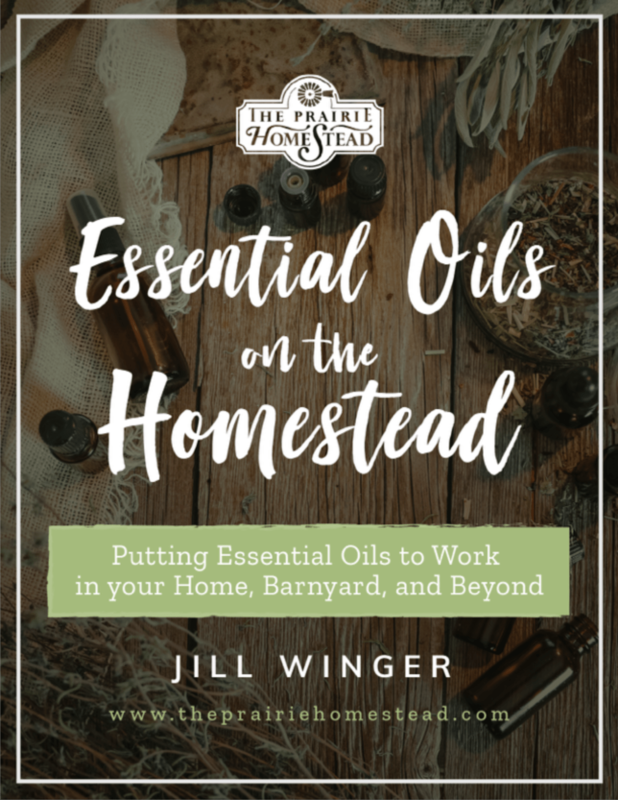 If using oils 1oz even if combining. My butter sells out every year. I never use coconut oil as its heavy. Heather, Do you have a specific recipe that you use? I also find coconut oil to be too heavy and greasy. I’m looking for a recipe that would be good without it! I made a similar body butter a week or so ago and it just hardened right back up after I whipped it so now I have to microwave it for a few seconds each time I want to use it. Does this stay creamy after it’s whipped and sits for a day or two? The batches I’ve made have stayed creamy– as long as it does not get too warm and melt down. I had the same problem. It smells great & goes on great once I rub sone between my hands to emulsify it. But, its tough to get out of the jar since it’s hardened. I have followed the recipe exactly for the non-cocoa butter version and it’s not setting up. I left it out even overnight and it’s still just liquid?? What did I do wrong? Thank you! It should set up if you put it in the fridge. 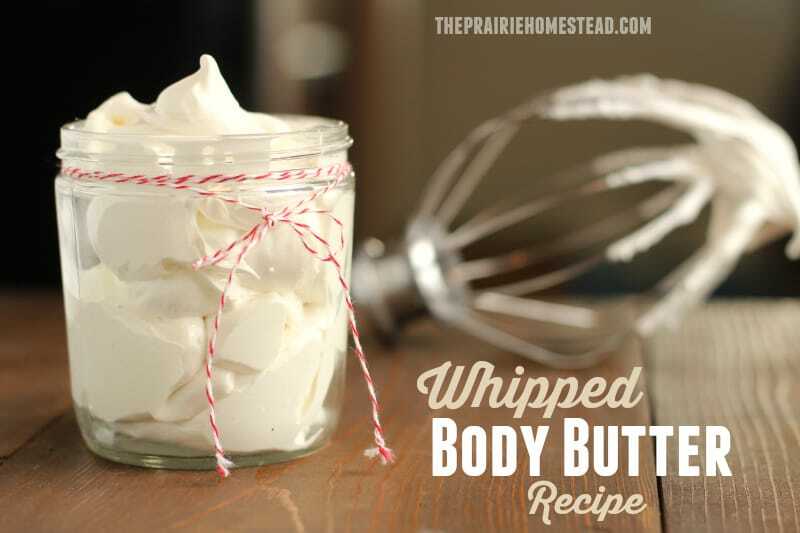 Love this recipe!, I love the feeling of whipped body cream.. I just tried this recipe (with peppermint essential oil & cocoa butter) and it turned out perfectly! I used 2 tbl corn starch as suggested and I’m so happy with the results. It smells and feels so good, I have to stop myself from eating it! Can’t wait to make more and try out other essential oils for christmas gifts, Thank you! Yay! Good idea about the cornstarch, too. I made this recipe and used cornstarch as well. It came out perfect and is silk smooth, but when the oil is absorbed into the skin there is a slight residue feeling. When do you add the cornstarch? Before it solidifies or when it’s being whipped? I added it during the whipping process. Would grapeseed oil work in substitution for the almond oil? Hi how long does the recipe larst . Ie will it go moldy. How many 4 Oz Mason jars can I get out of this recipe? I just made this recipe as written and I got exactly 3 4oz jars from it. What size jar will one recipe fit in? I just made this but for some reason has a strong smell of the raw Shea butter I used olive oil to replace the sweet almond could that be why I used over 30 drops of essential oil and still no good smell at all? I know different brands of shea butter can vary in scent– also, olive oil is stronger smelling than almond oil. Unrefined shea butter has a smell while refined shea butter doesn’t. That may be the issue for you. I just made this and it whipped up really nice. I used the recipe for the cocoa one and added orange EO. It smells really fresh. Hoping to make it for Christmas gifts. Thanks for sharing! LOVE the idea of adding orange EO to the chocolate version! So I made the non cocoa butter recipe and I added lemon essential oil and frankincense essential oil. I LOVE this butter! A little goes along way and while it feels a bit oily at first , it does absorb quickly. I think my skin is so much softer and smoother using this than any store bought or premium luxury brand product. And using all organic non gmo, pure ingredients makes it so worth it. An awesome body butter with only 4 or 5 ingredients -Wow! I am a convert now! I am making the cocoa butter recipe now and I don’t have any essential oils on hand that I think will blend nicely fragrance wise but I think the Cocoa smell will do just fine . Thank you so much for sharing your recipe ! So thrilled you are loving it as much as I do, Tam! I can’t wait to make this. How many jars does this recipe make? I need to make quiet a few for presents! It depends on the size of your jars… It makes a little over a cup. I must have whipped mine too much, it made about 3 cups. It’s fluffy like whipped cream! I made several batches of body butter last year for Christmas presents. 3 of the 5 batches I made separated into a mess after a few days. Had to throw it out.When I researched it, found that it matters what temperature you melt ingredients. But not one recipe I found mentioned that. What do you know about that? Youu need to mix oils below 160 fereinhigt. 130 is ideal. Outstanding stuff! Since we live in the Deep South, I followed recipe and tips but added 2 tsp beeswax in the melt and 1 sifted tsp corn starch when whipping. Had finished product in 90 min. After an incredibly busy day with the kids, my wife was ready to crash. This made the perfect massage oil for her neck, shoulders, calves, and feet. It’s absorbed well and a little goes a long way! She is now sound asleep and all is right in the world. Thanks! Yay! Major brownie points for you!! Thank you for the recipe. I’m hoping that this works in Taiwan….I did use the beeswax and cornstarch just because of where we live and humidity…I just wanted to make sure that I had something that worked. But it worked…set up nicely in the fridge and then whipped pretty nicely. I’m very happy with this..so thank you for this recipe. Hi Jill, this is a great recipe. I’ve made it in several ways. One added ingredient I’ve used is a little bit of tapioca or arrowroot flour and it’s less greasy. Also I found out that if you heat shea butter too long it can be grainy. One time my butter was grainy and I couldn’t figure out why but then I stumbled upon the reason somewhere online. Just passing these tips along to help someone else perhaps. Great idea about adding the arrowroot powder! Can you use mango butter in place of the cocoa butter? I haven’t tried it, but I think it would probably work! This recipe is great! I added vitamin E. I gave this out as Christmas gifts and my friends & family rave how great this body butter is. I package this in 4 oz glass jars. My question is I hear people tint their body butters. What are you’re thoughts on using food colorings? Love the vitamin E idea! I’m not sure about the food colorings– my biggest concern would be them staining clothing, but I haven’t tried it so can’t say for sure! try micas. They wont stain. The food coloring is hydrous meaning water based. This recipie. Is anhydrous it will repel the color. I think powered mica would work. I use it to tint lotion bars for a sun kissed look. Good luck! We made this today, let it set… Whipped it up and spooned it into the containers… And the oil separated from the rest… Any ideas? We measured everything, used the same ingredients as you, no substitutions. We placed the containers in the fridge…. So hopefully they combine and stay a solid. Thank you for the recipe! I have a daughter that is allergic to almonds anything I can substitute for the almond oil? Thank you! I am planning to try it for her first slumber party! Can I substitute a different oil for the coconut oil? Maybe jojoba or grapeseed? Or perhaps more of the butters? I think I’m the only person on the planet that doesn’t like the smell of coconut oil! And I find it so overpowering, negating all other scents. I just use refined coconut oil– it doesn’t have a smell. I know this is an older post, but just came across it on Pinterest… I’m wondering what the finished consistency of this is. I’ve tried a few different recipes, but I’m looking for something that would be able to be used in a container with a pump on it. Would this recipe be too thick for that? I wouldn’t use it with a pump– it’s definitely too thick for that. 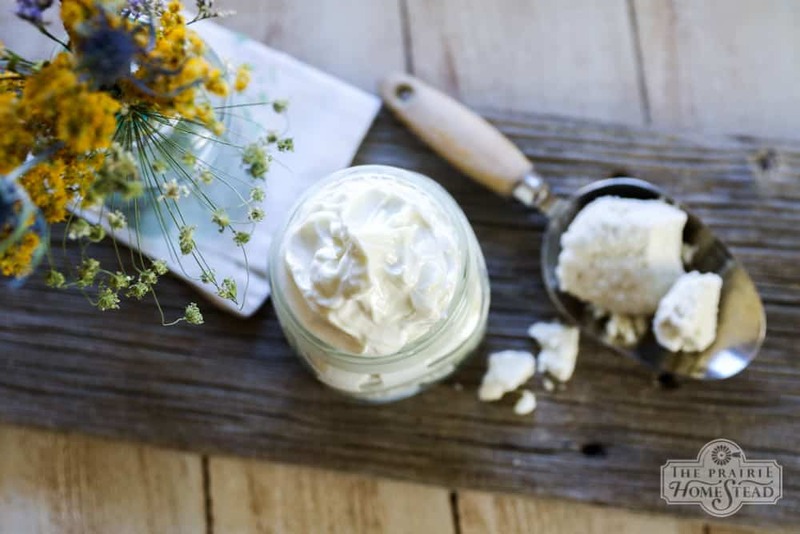 Do you have any recipes for goat milk body butter? I just made a batch over the weekend and it came out great! I loved the consistency of the whipped butter. It’s a bit greasy when first applied but then absorbs quickly.My skin looks and feels really hydrated. I will sub the oils and fragrance on my next batch. I am so glad I found this recipe 🙂 Thank you! So glad you like the recipe Sharan! Do you have a lip balm recipe? Also, what would you use to add color? I just made two batches…they look and feel lovely. Thank you for sharing. Hi there, I have already made your white chocolate body butter twice. It smells so amazing that I didn’t want to spoil it with any EOs. My skin loves it, it has become smooth and acquired a certain glow. I’m sure it is an afrodisiac as well as my husband also loves when I use it. 😉 Greetings from Hungary! Hey Varga! I am so happy you love that recipe as much as I do! I made this without almond oil and essential oils. Using this fluffy and rich cream on my face. It’s amazing for my dry and sensitive skin. I’ve been using for month and my skin thanks me every day. Decided to mention that essential oils should NOT be used on the skin like this… They are irritants and should be careful with them. Should avoid sun exposure too. I’m glad you are liking the recipe, Nina. I disagree about essential oils being used on the skin, however. There are definite benefits to using diluted, proper amounts of essential oils topically. And not all oils increase photo-sensitivity, either. I was wondering if I could use liquid coconut oil that I have on hand rather than the almond oil? I wasn’t sure if the liquid coconut oil and solid coconut oil together would work. Can I use cold pressed Hemp oil instead of almond oil? Is it possible to substitute something else for the coconut oil? I’m horribly allergic to all coconut products. I know this is an older post but just come across it and love the sound of it,,,but was wondering if i could poke a hole in a vitamin E jel capsule or two and add that to the recipe??? Thank You love everything you do, just wish i knew ya in person!!! Argan oil is high in tocopherols and is good for the skin, as is castor oil. Is it okay to substitute refined shea butter in the place of unrefined? I’ve read that it maintains the same benefits, but I’ve also read that it is inferior. Truth is, I can’t stand the smell of unrefined shea butter, and I’ve heard that refined is less pungent. Also, do you think a vanilla and coconut essentials oil combo would be good for a fragrance regarding the the whipped body butter? Thanks for the recipe! I am new to EO and diy stuff. I made lip balm today and it was pure yummy goodness with nothing bad or undesirable. So I decided to make the body butter with cocoa butter. It turned out perfect. I don’t know why some have had problems with it turning out. Mine is perfect. Also it’s not oily at all. I live in WI and my skin is drinking up the extra moisture I am giving it. I didn’t add any EO to this. I want to use it on my face as well and didn’t want it to smell like that. Will definitely make this over and over again. I tried recipe 2 and it is very oily. Please advise what I might have done wrong. I am wondering if I did not let it set properly. I’m making this now and it is AWESOME!!! Turned out perfectly and the house smells divine. Thank you so much!! Made this tonight and it’s wonderful, thank you! I love how simple your recipe is for body butter. I was wondering about how many 8oz jars can I fill from a batch of the regular body butter? Also, about how many batches of body butter can you make from the 16oz of unrefined shea butter? Thank you! What does the almond oil do? Would the consistency change if I omit it? I love this body butter recipe. The second batch I made grew a little black mold in the jar after a few weeks. Yikes. This didn’t happen with my first batch. What did I do wrong? Please advise because I want to make this again. I made this for a friend and she absolutely loved it! I thought it was very easy to make and had to make an extra batch for me!! Great idea to leave links next to the ingredients-very helpful!! I just made two batches…they look and feel lovely. I substituted sunflower oil for the almond oil as I know it is healing and I wanted the recipe to be nut free. Thank you for sharing. Can I melt my Shea and coconut oil in the microwave? I have used the microwave to melt both with no issues… just do it in 20/30 second increments until desired consistency. If using a block of shea butter instead of the discs, how do you measure it? Melt it first, grate it or ???? Thanks so much for your great recipe. This did not work for me at all. I guess because I live in Florida and the humidity is really high. I tried this three times and have wasted $30 in lotion an oils. I also added cornstarch and still nothing happened now I have cornstarch lotion. Super fail for me! 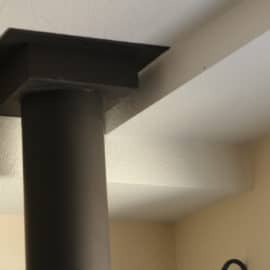 Try adding a couple of tbsps of beeswax. Or keep in the fridge. I live in Fl also and have made this several times for myself and friends and family. Trial and error and not giving up are the keys. Ok so I tried the recipe but I cut my heater on last night before bed and awakened to melted whipped body butter can it be fixed HELP!?!! What would happen if I didn’t whip the ingredients but simple melt the shea butter and coconut oil, pour in jar, place in fridge until solidified? Any chance you can also use this as a facial moisturizer? Or would it be to greasy? I switched the almond oil for olive oil and I couldn’t get it to set. It stayed liquid even at room temperature l. Any idea how that might have happened? Amazing!! Subbed almond oil with avocado oil because I had that on hand and added 1 tbsp of arrowroot powder! It’s perfect! Won’t go back to store bought! Hi! Coconut oil has to be virgin coconut oil? 🙂 Hoping you’d respond. My last batch smelled like chocolate even tho I added EOs. May sound good to others, but not for me! I know you have a recipe w/o cocoa butter, but too much Shea can stink! What is a good sub for cocoa butter… mango, kokum or babassu butter? The more butters there are the less the stink of shea!!! Thanks!!!!! I cant seem to get this to whip even though I added cornstarch. Any help would be appreciated. I have made body butter numerous times and I am looking for an ideas on how to make body butter less greasy. I cannot see this recipe not being greasy as it claims to be. looking amazing! Can’t wait to try it. Hello, I know this post is really old but I’m hoping you’ll still read it. I absolutely love this recipe. I make it all the time. My only issue is each time I make it I get a different consistency. I love the whipped consistently a lot like whipped cream, but sometimes I get a more creamy consistency. Is it possible to over beat my body butter? This seems to only happen when I make larger batches. But if all the ingredients are in the in the same amount I don’t know why the texture changes. Do you have any ideas? Made this today. Single batch. I added the cornstarch. I added a balance mix of eo. Delish! You shouldn’t eat shea butter 🙂 But it does look yummy, and like whip cream :p.
Shea butter is actually used in cooking in Africa. I think it taste nasty, myself, but obviously some cultures think it tastes good. This may be a stupid question. Do you use separate pans and mixers for your body butters and other non-food items? I haven’t made any of these before, and I didn’t know if it would be okay to use the same equipment I use for my food. Question: is the measurement for the shea butter when it is a solid or liquid? I ask bc I had chunks of shea butter which had a fair amount of air space between them, but it seemed pretty close to the 1 1/2 cups I needed to triple the recipe. So I melted it separately, first, to check. It was nowhere close! I chopped up little pieces of shea butter to add until the melted stuff reached 1.5 cups. So now I don’t know if my recipe is going to be all off 🙁 Does anybody know the answer? Hello! How much does this recipe yield? I’m needing 15 cups for gifts for Christmas. Hi there. Instead of sweet almond oil will regular olive oil work? Jill, I have a question. I’m looking for a skin moisturizer I can use regularly on all of me – not just as a hand-cream. I’d like to make the body butter, but am wondering if these oils will come off on clothes at all? I’m assuming, if you apply a little and massage it well into the skin, that it will not, but I didn’t want to invest time and money into, if it will end up staining clothes, or smelling rancid if it gets into fabric after a while. I appreciate your experience and feedback! Thanks! Yes in the south my skin is so super dried out so IVE been using a homemade 100 percent all natural goat’s milk body butter recipe on my body and let me say that IVE only been using thus a few weeks the transformation to my skin is amazing. Hi there. Instead of sweet almond oil will regular coconut oil work? Thanks for sharing this! It’s wonderful! I tried to make it at home and it whipped like yours which is creamy and fluffy! But after I put it in the container and left for a couple of hours, it’s hardened a bit. Still spreadable but not as creamy and soft as earlier. It’s like butter cream put in the fridge. Is it normal? I just put at room temperature like around 22 or 23 degree c.